On Earth, we've got a lot of traditions for not being jinxed with bad luck. In space, astronauts can't leave things to fate. Instead, they get to live by the motto of, "There is no problem so bad that you can't make it worse," the make plans on how to deal with every possible contingency. 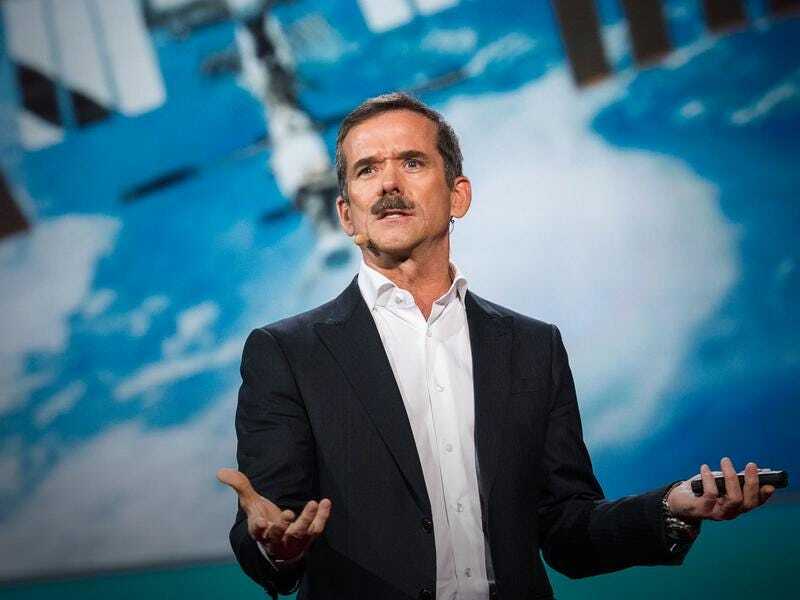 Hadfield's TED talk embraces that philosophy, relating it to his time in space, and how it applies down here on Earth. We've previously cooed over Commander Hadfield producing the first music video in space, then getting painted as David Bowie for a magazine cover. This man doesn't know how to stop being cool. Update: Chris Hadfield + Amanda Palmer = Win. At the impromptu last-minute Vogue show last night, Hadfield sang, then Palmer serenaded him with a song about astronauts. The only video I've found is by an audience member with the always fun-sideways-shot & jittery, but the sound quality is great. Thank you, Leila, for tipping me to the event! Why did I spend last night grading student assignments instead of going out? Clearly, that was a strategic error.